The Discounted Cash Flow (DCF) method is used to arrive at the valuation of a business. DCF values the business entity as an asset, computing its present value from expected future cash flows. These cash flows are discounted back to today’s money value using the "Cost of Equity". This approach has the advantage of allowing the business value to be assessed under a range of risk/uncertainty assumptions, by varying the Cost of Equity (see the chart below). The Asking Price is the best quoted price at which the business owner is willing to sell the business. Pictured below: Business Value graphed against a range of discount rates (Cost of Equity (%), x-axis). Marked on the line: Business Value at Cost of Equity equal to 15%. Whilst Sales Revenue doesn't feature directly in the valuation, it's presented as the starting point because forecast sales have a major influence on Net Profit, which is a key driver in the calculation. In addition, Sales Revenue is the main indicator of business size. Net Profit is total sales less both direct costs and overheads. The higher the profit forecast, the higher the business valuation. This is the expected average Seller's Discretionary Expenditure (SDE) over the next four years. SDE is a cash outflow of discretionary expenditure that is not part of normal business operations, such as an owner’s benefits, one time investments, and any non-related expenses. Discretionary earnings are added back to Free Cash Flow to Equity (FCFE) and, therefore, increase the business valuation. The difference between the Current Assets and Current Liabilities represents the Working Capital available to the business. The valuation tool calculates the change in Working Capital available using the estimated growth rate(s). The greater the increase in forecast Working Capital (calculated as Current Assets less Current Liabilities), the lower the Free Cash Flow to Equity (FCFE) and the lower the business valuation. Conversely, if Working Capital is forecast to reduce, then this increases FCFE and, in turn, the business valuation. The higher the Depreciation Expense over existing fixed assets, the more that gets added back to the FCFE and the higher the business valuation. These a planned purchases of new Fixed Assets over the next four years. Expenditure on fixed assets reduces the FCFE and, therefore, the business valuation, whereas asset sales (if any) increase the FCFE and the valuation. This is the estimated annual average Depreciation Rate (%) on Fixed Assets over the next four years. It applies to new fixed asset purchases during the forecast period. Loan repayments decrease the FCFE and, therefore, reduce the business valuation. New loans, on the contrary, will increase the FCFE and the business's value. 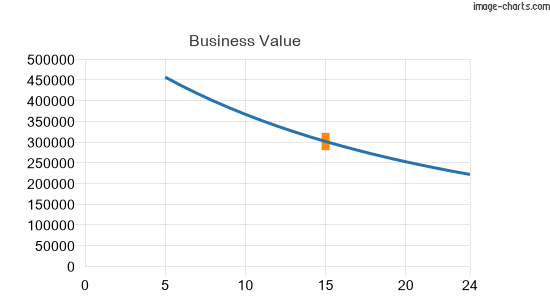 The DCF (Discounted Cash Flow) valuation method computes the intrinsic value of the business. The business value is obtained by discounting expected cash flows to equity. The FCFE (Free Cash Flow to Equity) is the residual cash flow left over after meeting interest and principal payments and providing for capital expenditures to maintain existing assets and create new assets for future growth. Cost of Equity is the expected return a buyer requires when putting money into a business. It shall be understood as an opportunity cost, i.e., the rate of return that the business owner can expect to make on other undertakings of equivalent risk. For mature and more-or-less predictable businesses, this rate is typically within the range of 12–25%. However the riskier the business and the more uncertain the future, the higher the rate used. For calibration, a start-up company's Cost of Equity could exceed 100%, whereas a state-owned utility company enjoying a near monopoly may have a Cost of Equity as low as 5%. Discounting is the discourse of determining the present value of future cash flows. According to the time value of money, a dollar is worth more today than it would be worth tomorrow given its capacity to earn interest (return on investment), and being devalued by inflation. Discounting is the method used to figure out how much future cash flows are worth today. Present Value is the current worth of a future stream of cash flows given a specified rate of return. Future cash flows are discounted (devalued) at the discount rate, and the higher the discount rate, the lower the present value of the future cash flows. Determining the appropriate discount rate is the key to properly valuing future cash flows, whether they are earnings or expenses. In the discourse of calculating the present value of Free Cash Flow to Equity (FCFE), the discount rate equals the Cost of Equity. Business valuation inevitably relies on factual as well as forecast information provided by the business owner. Whilst the Discounted Cash Flow (DCF) valuation method processes data inputs using a number of precise mathematical techniques, such as discounting, present value, and weighted average, the data inputs, as estimates, represent significant unknowns. Thus, the valuation results must not be interpreted as exact, true values as the actual outcome of all future business activities undertaken is always unknown. This Valuation Report has been automatically generated by the Business Valuation Tool, an online service of ExitAdviser and not as part of an appraisal practice as defined by USPAP (Uniform Standard Professional Appraisal Practice) standards; therefore, is not bound by the requirements of the USPAP. The valuation result should not be considered as financial advice or any form of recommendation to sell, buy, or merge a business. This report shall not be used to obtain credit or for any other irrelevant purpose or by any other party for any purpose. ExitAdviser shall not be liable for any losses or expenses arising directly or indirectly out of the use of or reliance on the valuation result.